The Perfect Plus Pressure Cooker is your fitness center for culinary pleasures. Whether vegetable, potatoes, whether fish or meat, sliced or en bloc, whether roasting, braising, stewing or steaming. The Perfect Plus manages everything. Use the pressure cooker to cook soups and stews, to sear and braise meat, to stew or steam vegetable, fish, poultry, to prepare several side-dishes or a complete menu at the same time, to defrost frozen food, to boil down fruits, vegetables, meat and much more. Even wholefoods or light diet dishes are prepared easily in the pressure cooker. 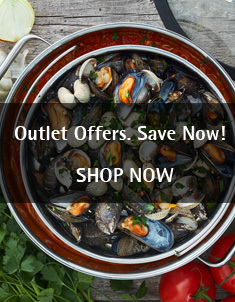 Due to their technical advantages pressure cookers are completely uncomplicated. The residual pressure locking with colouRed indicator as well as the flame prevention for all pot handles characterize the pressure cooker with the TransTherm® universal base. To clean the handle, just remove it and hold it under running water. All pressure cookers are accompanied by operating instructions and a separate cooking time-table. The pressure cooker Perfect Plus is your fitness center for culinary pleasures. Whether vegetable, potatoes, whether fish or meat, sliced or en bloc, whether roasting, braising, stewing or steaming … Perfect Plus manages everything. Use the pressure cooker to cook soups and stews, to sear and braise meat, to stew or steam vegetable, fish, poultry, to prepare several side-dishes or a complete menu at the same time, to defrost frozen food, to boil down fruits, vegetables, meat and much more. Even wholefoods or light diet dishes are prepaRed easily in the pressure cooker.